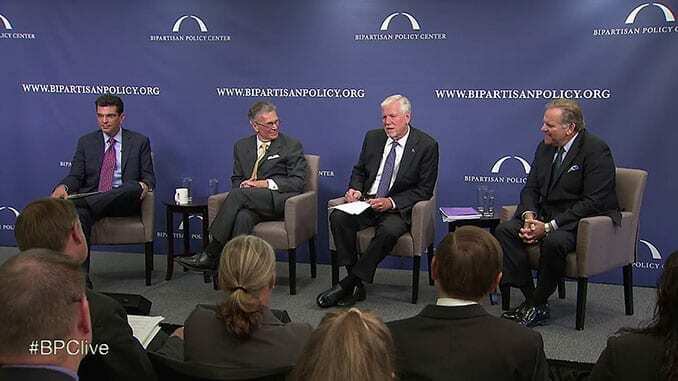 Kansas State University recently co-hosted an event at the Bipartisan Policy Center, a Washington-based nonprofit organization, highlighting the threat of agroterrorism and the importance of including agriculture in biosecurity and biodefense. The panel discussed the 2015 Blue Ribbon Panel on Biodefense report, which noted the U.S. is still highly vulnerable to biological agents, including biological weapons and natural disease threats to agriculture. Rogers, former chairman of the House Permanent Select Committee on Intelligence, described how terrorists have become much more sophisticated and he highlighted the discovery of a laptop in Syria with a documented strategy for using biological warfare. Myers said that when U.S. troops went into an Afghanistan cave in 2002, they found an al-Qaida list of planned bioweapons pathogens, including six human pathogens, six livestock and poultry pathogens, and four plant pathogens. Crops are the under-addressed aspect of bioweapons, Myers said. A major outbreak of food animal or food crop diseases would do more than create an economic impact; it also would create fear among people and lead to distrust of the government – exactly what terrorists want. The university’s biosafety level-3 Biosecurity Research Institute at Pat Roberts Hall supports comprehensive infectious disease research programs that address threats to plant, animal and human health. The Institute is jump-starting research planned for the National Bio and Agro-defense Facility (NBAF), including work on Japanese encephalitis, Rift Valley fever, classical swine fever and African swine fever. Tammy Beckham, dean of the College of Veterinary Medicine, participated in a second panel at the Bipartisan Policy Center. She has spent a majority of her career in protecting food systems and discussed how to better use resources to combat bioterrorism. Beckham noted critical gaps in the U.S., such as inadequate countermeasures, undeveloped diagnostic tests and a lack of a comprehensive biodefense program. She said it is important to incentivize people and organizations to improve biosecurity and address One Health — which involves connections between human, animal and environmental health.